First of all, I love this machine. It’s been great, had it since Christmas. But it didn’t start off that way. I’ve had a few problems right from the start. As you can see from the first picture it’s a beautiful saw, just doesn’t have the Fence installed. Thats because it was shipped with the fence for a G0771. Worked with Grizzly support and let them know of the shipping mishap and they took care of it without a problem. I also found a few other problems; while cleaning it off I noticed that there was a mark along the front of the riving knife. When I tried to wipe it off it was actually a hairline fracture and the tip of the knife fell off. You can see that in the second picture on top of the box for the fence that was shipped. Luckily this didn’t fall off while testing the blade and become a projectile. Again Grizzly support worked with me and sent me a whole new riving knife and blade guard assembly, apparently it’s a package deal. Now the one I’ve seen a lot of complaints about, and I had the same problem, was the cheap manufacturing of the shop fox mobile base. I’m thinking I can change the wheel assembly to rid myself of the wobble wheel problem before it falls completely apart, but I have yet to do that. The latest go around is again a shipping issue. I purchased the Long Rail Kit, Extension Table, Zero Clearance insert, as well as a few other parts; and all seemed well, until I started to install the Rail Kit. I should have known better when the box was taped over with tape that said Tyvek and had no shipping straps. But as you can see from the last picture this appears to have been a returned item that was shipped to me. Someone had notched out the rail as well as widened some of the holes as if to fit it on a different saw. The support leg assemblies were missing as well as all the hardware (other than what was bolted together). I have just this week gotten the mess boxed back up and taped it much better this time. I’ve last heard from Grizzly support that my “replacement” has been shipped and that has me a little worried. You know how my New Purchase has now become a “replacement” item has me thinking that I’m going to get another returned/used item of poor quality. Again, like I first said; I love this saw, it’s a great saw. But, product handling has got some major problems. Out of the two purchases I’ve made with Grizzly, both have had problems. Now if you count the number of items I’ve purchased it doesn’t look so bad. 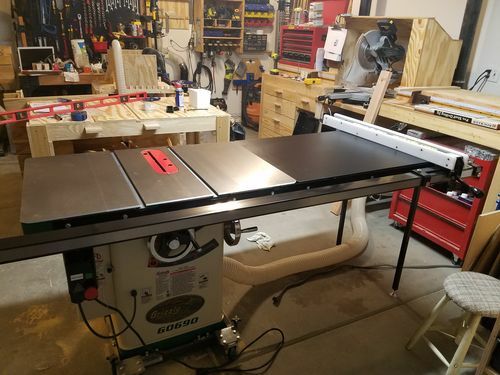 Table saw, Mobile Base, Boeshield (great stuff), Freud Dado Set, 5pc Safety set (crap but push stick is okay), Clamping Miter Gauge, Extension Kit, Long Rail Kit, Blast Gate Holders, Zero Clearance inserts. 3 out of 10 isn’t too bad of numbers, but I have yet to wrestle with the Zero Clearance inserts. You are a pretty easy going guy I see. 3 out of 10, that sound terrible to me. That is what scares me about Grizzly, practically no QC. Just throw some stuff in a box and send it on. If you get a good one, you are all set. If you get a bad one, the time, hassles and delays negate any cost savings or value in choosing Grizzly over a competitor. Hopefully, you get it all ironed out and enjoy the new saw. You are generous with your stars. To me, customer service and getting it right are very important. Having to deal with the hassles that you have on a saw that costs a lot of many is just wrong. I guess I am a bit Gullible. I’ve been very happy with my purchase, based on value and performance. This is however my first cabinet table saw, and I may not be as seasoned as most, but I’ve made a choice and started down a path that will be difficult and costly to start back from scratch with something more expensive. I guess you get what you paid for, but I still feel that I have spent less and received better quality than what I could get for the same money. I purchased the G0691 and had several issues as well. Here is the laundry list of problems…all have been resolved and the saw has been working great (finally). They definitely have an issue with Quality Control!!! 1. Initial cast iron top was not flat. It had a high spot directly in line with the arbor. I could set my flat edge on it and spin the flat edge like a top. The main top was out of flat by .011”, not good! Called up Grizzly and technical support informed me their tolerance limit was .015”, so they were not going to replace the main top. I was not a happy camper, but I pressed on with assembly. 2. Installed miter gauge and adjusted set screws to take out slop. Slid miter gauge through to the out feed side of the table with no issue, but could not slide the miter gauge back through the in feed side of table. There was a .007” difference between the in feed and out feed. Long story short, they replaced my main cast iron top (problem #1 resolved). 3. It took 3 attempts to get a good top. The first two where dented upon arrival, the third was double wrapped and arrived damage free. 4. While replacing the main top, I checked to make sure that all the hardware was tight inside the cabinet while the top was off. It was not. Two bolts on the trunnion assembly were hand tight only and three others were loose, I was able to tighten a full turn. Glad I checked. Quality control seems to be non existent. 5. Cast iron extension wings are not perfectly flat with main top from front to back, .005” difference in spots. 6. Do not expect the wooden extension table to be flat. It is not even close. Final thoughts: Customer service was great AFTER the first issue was resolved. Saw performs excellent. Maybe the saying “you get what you pay for” it true when it pertains to quality control…definitely do your own quality control inspection on the entire saw. I have 4 Grizzly tools, one is a 690 saw. Are they perfect? NO, but the problems I had were minor and were all taken care of quickly. I also have looked at Powermatic at my local wood worker shop and saw flaws on the saw sitting on the show floor. The only saw I have never heard anyone say they had problems is SawStop. I am sure people who have a SawStop saw do have some problems as well, they just don’t talk about it. None of these tools are cheap and I wish they were all perfect, but they aren’t. 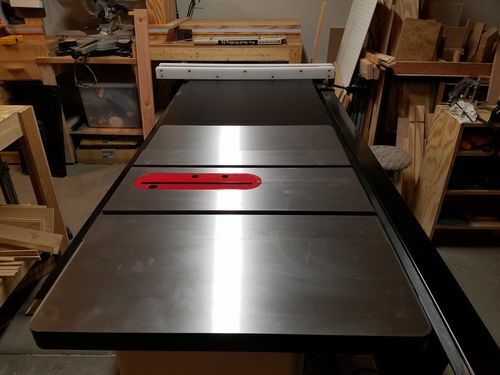 I paid $4000 for a CNC machine and it was so bad I wound up taking it back for a refund. It seems that no matter how much you pay for something, there may be some problems. I am just glad Grizzly takes care of the problems we have with their machines, and I hope other manufacturers do the same. is grizzly turning bad ? is the question ? IMO I don’t think the prices are to bad for what you are getting …thing is how is customer service ..as this is what defines a good company from a great company ….I think they all have issues the thing is how quickly it gets resolved ….I am always searching for a newer table saw ..but still like my walker turner …should I stop looking at grizzly as a replacement …or are they selling 1000s of saws ..and I’m only hearing about the BAD ONES ?? is grizzly turning bad ? is the question ? IMO I don t think the prices are to bad for what you are getting …thing is how is customer service ..as this is what defines a good company from a great company ….I think they all have issues the thing is how quickly it gets resolved ….I am always searching for a newer table saw ..but still like my walker turner …should I stop looking at grizzly as a replacement …or are they selling 1000s of saws ..and I m only hearing about the BAD ONES ?? Don’t get me wrong, I think the Customer Service is great. They are kind and courteous every-time I’ve talked to them. They are apologetic for any problems I’ve experienced. And I believe they do everything they have the ability to, in order to resolve problems. It is most definitely the Quality Control or lack there of. Now in any production line it would be costly to inspect every part or assembly going through, but random selection should (and I suspect does) happen to verify a major production problem. I don’t think that is an issue. Shipping overseas can have it’s problems too, damage or loss or simple miss labeling can happen. I don’t think that is an issue. I think any part of first casting to arrival in the US isn’t where the problem exists. Warehousing could be part of the problem, but I don’t think it is. I think the downfall lies in shipping and receiving wholly. My first incident was someone not paying attention to what product they were pulling from inventory, or someone marking the wrong product to be shipped to me. I was hoping to maybe find some individual that purchased a G0771 and got a fence for the G0690; that would be a simple mis-marking of which package goes where. But this last incident is obviously a completely different flaw in the process. I don’t think anyone inspected a returned item to see that major damage was inflicted on it and put it back in inventory to be shipped out again. That is totally unacceptable. There is no problem with any vendor selling used equipment; but when a customer purchases New and receives Used it’s actually against the law. Its the old used car salesman trick of bait-switch. I will update you all on what happens when I receive the shipment. I’m loosing faith in Grizzly, but that can easily change if this happens the way it should. I receive my original purchase. I would also be interested in hearing from anyone who has purchased directly from a showroom; picked it up themselves, and not encountered any problems. That would totally pinpoint the problem as a shipping and receiving/QC issue. I guess I am the only lucky one of the bunch. I have several Grizzly tools – 1023 cabinet saw, G0555 14 inch band saw and the 18-36 drum sander. All arrived with no missing parts or damage. @OP – that saw should last you a lifetime. Good luck with it. Sorry to hear about your problems. Companies shipping returned items for new happens. I bought a new pin nailer at Lowe’s only to find out it was a return with some parts missing. Had to take it back. Yep, it does get frustrating. Sorry it has taken a while to post. I’ve received the replacement rails; box was a bit worse for wear but everything was included this time and was original packaging. Even had the plastic straps on it. I’ve gotten it installed (not aligned yet) and all the parts are without defects. I lost track of some of the original bolts and nuts but luckily those came with it this time. I am happy and relieved that this didn’t go the wrong way and need to be shipped back a second time. My trust in Grizzly has been restored. Nice saw, how is it for power ? Are the controls smooth?